Ranked number four among the “Top 30 Safest Cities in Oregon,” the quaint city of Philomath, O regon (pop. 4,580), is nestled at the base of the Mary’s Peak in the Oregon Coast Range, just five miles west of Corvallis. Also known for its annual “Frolic & Rodeo,” which was voted best rodeo in the region eight times by the Northwest Professional Rodeo Association (NPRA), the city was named for Philomath College, which was founded in 1867 by the United Brethren Church. Today the commanding college building serves as the community anchor and home to the Benton County Historical Museum. A successful example of resident engagement, leaders from all sectors of the community, came together in November, 2014, to take a proactive approach to informing potential homeowners about the benefits of living in Philomath. During a special breakfast and 30-minute presentation, Philomath’s Residential Campaign Committee hosted 75 real estate agents, builders, developers and other residents at the city’s newly remodeled high school. The event was part of the committee’s strategy to give people a new, positive look at the community, and for most attendees, it was the first time inside the newly remodeled high school. Following a morning meal catered by a local bakery, Mayor Rocky Sloan welcomed attendees, and the group was treated to a “reveal” of the new “Philomath You’re Home” logo and branding campaign. 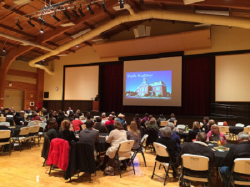 Presentations from city officials, business leaders, and others highlighted the “Six Reasons to Live in Philomath” and focused on the city’s rich history, bright future, sense of community, love of learning, health and wellness, and safety and livability. Presenters wrapped up the information session with the first showing of Philomath’s new promotional video.